Regulatory T (Treg) cells are a subpopulation of CD4+ T cells. Treg cells can be identified by a combination of different surface markers and the intracellular transcription factor FoxP3. Their main function is the suppression and termination of proinflammatory immune responses. They are considered to play a crucial role in several human diseases and mouse models. Treg cells represent 1–4% of all lymphocytes in secondary lymphoid organs of wild type mice. By contrast, in most TCR-engineered mouse strains the frequency of Treg cells drops to <1% due to defective Treg cell development in the thymus. Unlike human Treg cells, mouse Treg cells represent a more homogenous population and are characterized by expression of CD4, CD25, and the intracellular transcription factor FoxP3. Apart from that, Treg cells isolated from secondary lymphoid organs express the spleen/lymph node homing receptors CCR7 and CD62L. Treg cell populations can also be distinguished according to their origin: natural Treg cells (nTreg cells) develop in the thymus whereas induced Treg cells (iTreg cells) develop from naive conventional T cells in the periphery. Both subsets have similar phenotypes and comparable suppressive function. However, they differ in the epigenetic modification of the FoxP3 locus, which correlates with the stability of the Treg cell phenotype. (PMID: 19109157, 17298177, 18493985). Miltenyi Biotec has created dedicated applications to work with and analyze Treg cells. Spleen and lymph nodes must be dissociated into a single-cell suspension for many downstream applications, including isolation of cell subpopulations, cell culture, or flow cytometry analysis. Dissociation can be accomplished fully automatically using the gentleMACS™ Dissociator and specific Tissue Dissociation Kits (e.g. Spleen Dissociation Kit, mouse). Alternatively, tissues can be dissociated using a manual procedure. For details, see chapter Mouse Cell Sources. Miltenyi Biotec has developed numerous products for the magnetic separation of the various cell types and subsets that can be found in mouse spleen and lymph nodes. For details on MACS Cell Separation Technology, see the MACS Hadbook chapter Magnetic Cell Separation. Treg cells can be isolated easily and fast from spleen and lymph node cell suspensions by using the Regulatory T Cell Isolation Kit, mouse. Isolation of Treg cells from mouse spleen. CD4+CD25+ regulatory T cells were isolated from a mouse spleen cell suspension by using the CD4+CD25+ Regulatory T Cell Isolation Kit, an LD and two MS Columns, a MidiMACS™ Separator and a MiniMACS™ Separator. The cells were fluorescently stained with CD25-PE and CD4‑FITC (A) or Anti-FoxP3-APC (B) and analyzed by flow cytometry using the MACSQuant® Analyzer. Cell debris and dead cells were excluded from analysis based on scatter signals and propidium iodide fluorescence. CD4+CD25+ regulatory T cells were isolated from a mouse spleen cell suspension by using the CD4+CD25+ Regulatory T Cell Isolation Kit, an LD and two MS Columns, a MidiMACS™ Separator and a MiniMACS™ Separator. The cells were fluorescently stained with CD25-PE and CD4‑FITC (A) or Anti-FoxP3-APC (B) and analyzed by flow cytometry using the MACSQuant® Analyzer. Cell debris and dead cells were excluded from analysis based on scatter signals and propidium iodide fluorescence. Treg cells from FoxP3 reporter mice, where FoxP3-positive cells co-express a fluorescent protein like GFP or RFP, are usually isolated by flow cytometry-based sorting. However, magnetic enrichment prior to flow sorting is useful to increase the target cell frequency. For this purpose, CD4 MicroBeads, CD4+ T Cell Isolation Kit, and CD25 MicroBead Kit are the best choice. Mouse Treg cells can be distinguished from other T cells based on the surface markers CD4 and CD25 and more specifically by the transcription factor FoxP3. As there is no unique marker available for Treg cell identification, it is crucial to have a specific marker panel to avoid interference from other cells during flow cytometry analysis. Miltenyi Biotec offers a vast portfolio of conventional and recombinant REAfinity™ antibodies and flow analysis kits for comprehensive analysis. 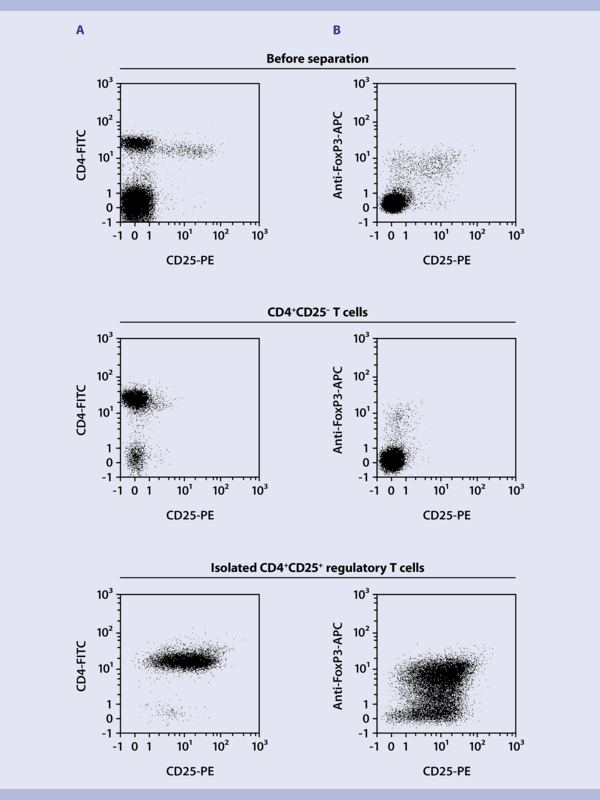 Since the transcription factor FoxP3 is one of the most reliable markers to identify Treg cells, intracellular staining is an important technique for flow cytometry analysis. Miltenyi Biotec offers a ready-to-use FoxP3 Staining Buffer Set which has been specifically developed to ensure effective staining with the various fluorochrome-conjugated Anti-FoxP3 antibodies. Dedicated mouse Treg Detection Kits (CD4/CD25/FoxP3) (PE) or (APC), which include fluorochrome-conjugated CD4, CD25, and Anti-FoxP3 antibodies and the FoxP3 Staining Buffer Set, allow the detection of Treg cells based on both surface (CD4 and CD25) and intracellular markers (FoxP3). Under certain conditions, Treg cells secrete anti-inflammatory cytokines such as IL-10. These IL-10–secreting Treg cells can be detected at a single-cell level with the Mouse IL-10 Secretion Assay – Detection Kits (PE) or (APC). In addition, IL-10–secreting cells can also be enriched by using the Mouse IL-10 Secretion Assay – Cell Enrichment and Detection Kit (PE). Treg cells are a small cell population. Therefore, cell expansion is necessary for downstream applications that require a larger number of cells. Miltenyi Biotec offers a harmonized combination of the cytokine IL-2 and the Treg Expansion Kit, mouse, providing optimized stimulation conditions for in vitro Treg cell expansion. Expanded Treg cells show stable FoxP3 expression and maintain the typical Treg cell phenotype. FoxP3 expression analysis after in vitro Treg cell expansion. Treg cells were isolated with the CD4+CD25+ Regulatory T Cell Isolation Kit, mouseIsolated cells were analyzed for FoxP3 expression directly after isolation (d0, left) and 7 (middle) and 10 days (right) after in vitro expansion with the Treg Expansion Kit, mouse. Treg cells were isolated with the CD4+CD25+ Regulatory T Cell Isolation Kit, mouseIsolated cells were analyzed for FoxP3 expression directly after isolation (d0, left) and 7 (middle) and 10 days (right) after in vitro expansion with the Treg Expansion Kit, mouse.